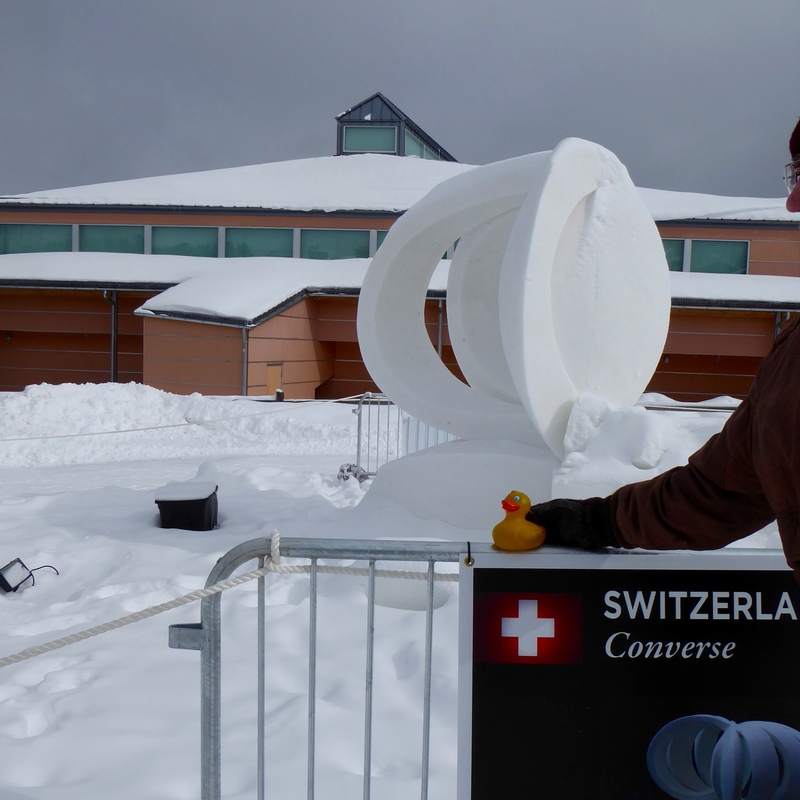 Freezing my rubber duck feathers with a temperature of only 4 degrees, the snow sculptures in Breckenridge, Colorado were the focus of our trip. I, Zeb the Duck, showed you sculpting in process last week. Now you will see the winners. 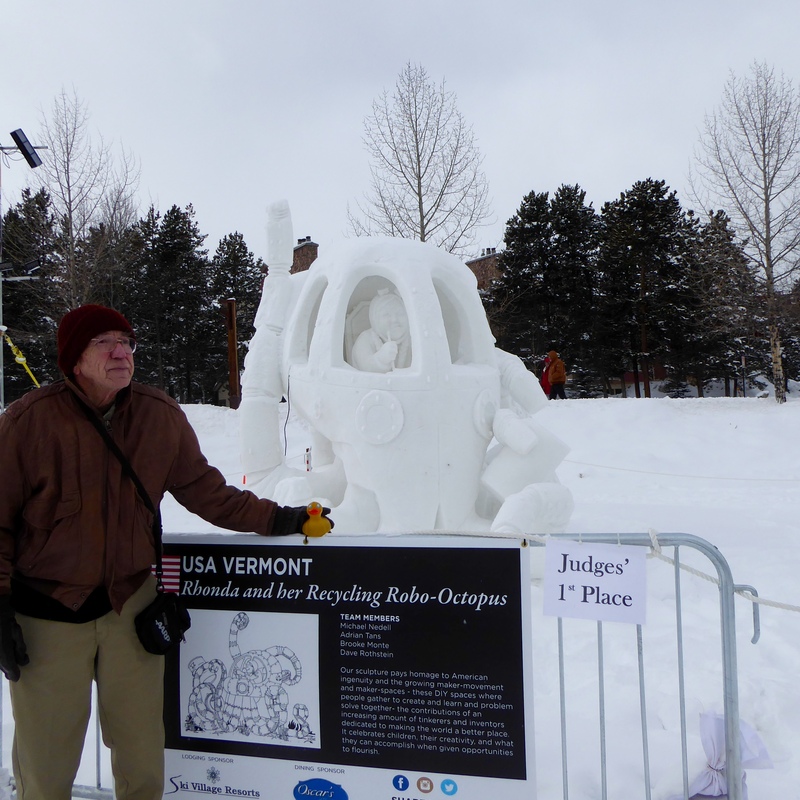 First place to USA Team Vermont with Rhonda and her Recycling Robo-Octopus. My friend, Tom, is holding me. Team Switzerland captured second place with Converse. 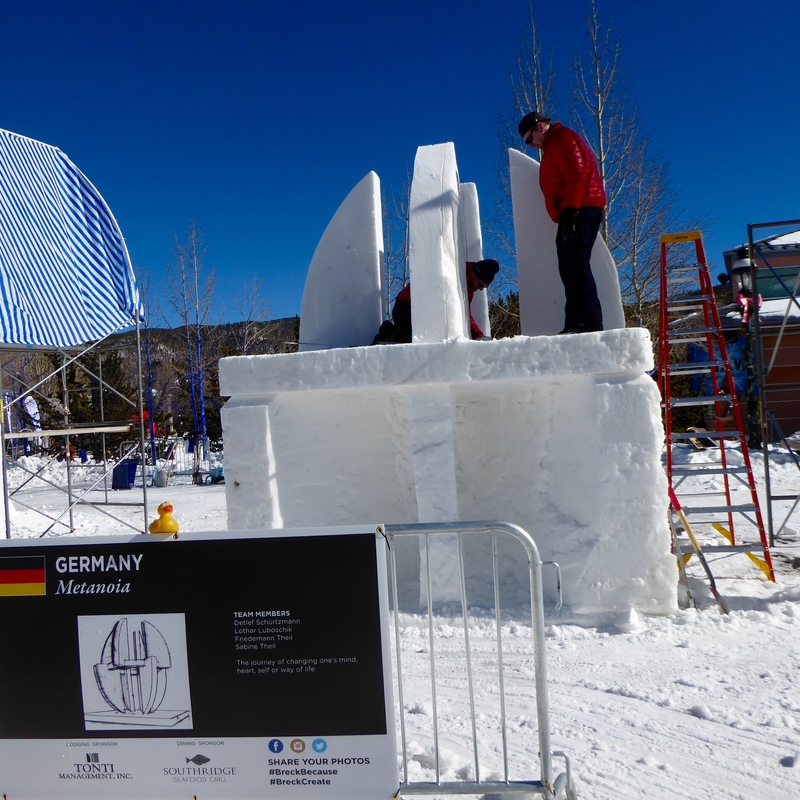 However, after Saturday’s judging, half of the sculpture fell off. Fortunately, it was after the judging. My friend, Tom, is holding me so I don’t become part of a snow sculpture. USA Team Loveland received the third place ribbon with Bolting From Extinction. but this week, just a pile of snow. That is so sad. 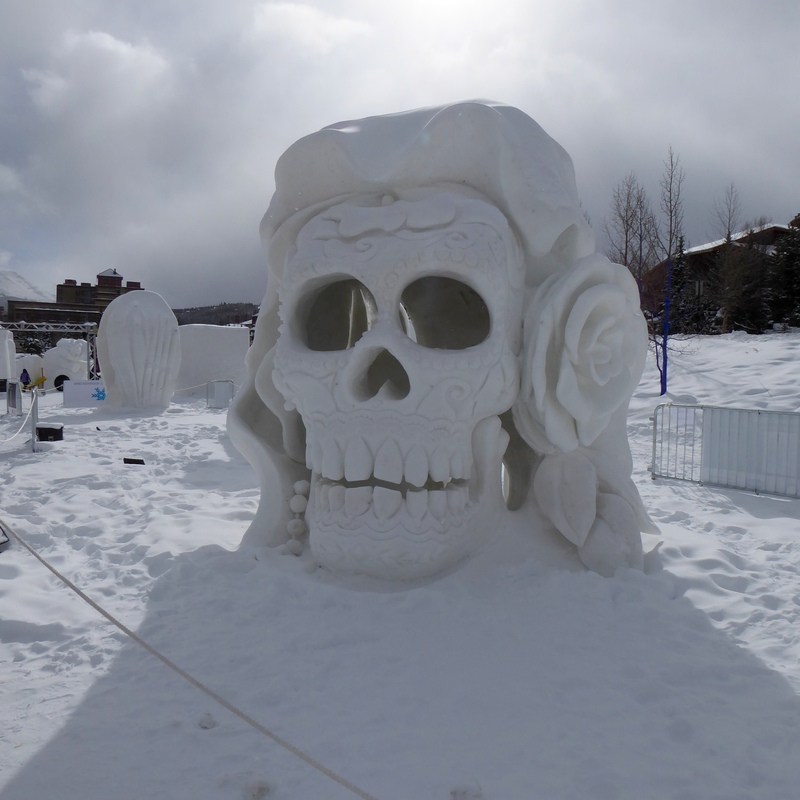 We want to show you more snow sculptures. Team Ukraine presents Love Wins. Depicting a fist symbolizing brute force, violence and war, that is stopped by an open palm. The open palm is a metaphor of peace and love. The artists hope that peace and love, with negotiations and compromise, will return peace to Ukraine. 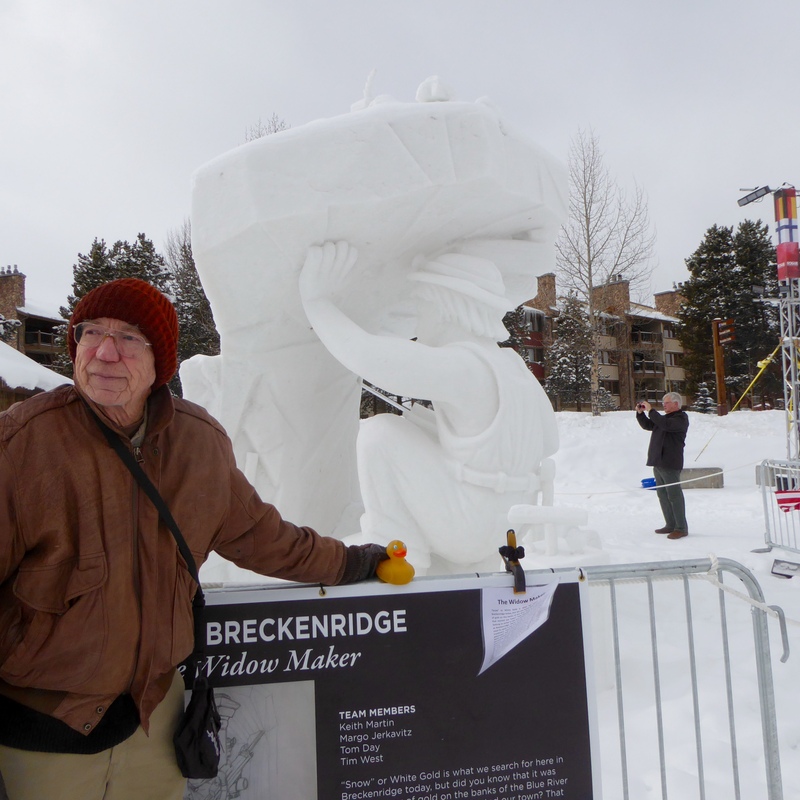 Team Breckenridge shows The Widow Maker, referring to the pneumatic drill once used to mine gold. My friend, Tom, is holding me again. 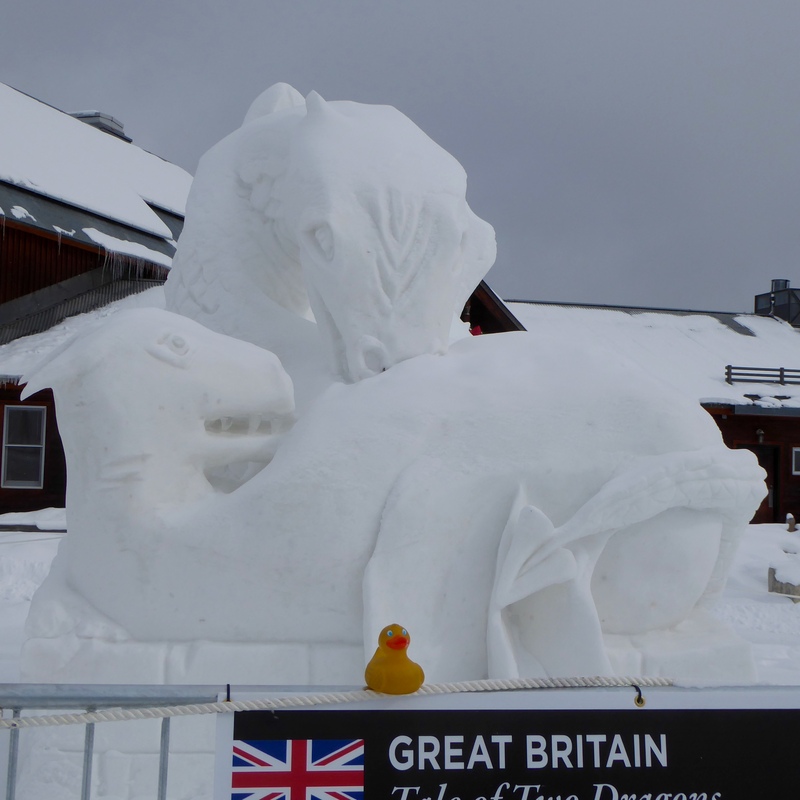 Team Great Britain created Tale of Two Dragons. 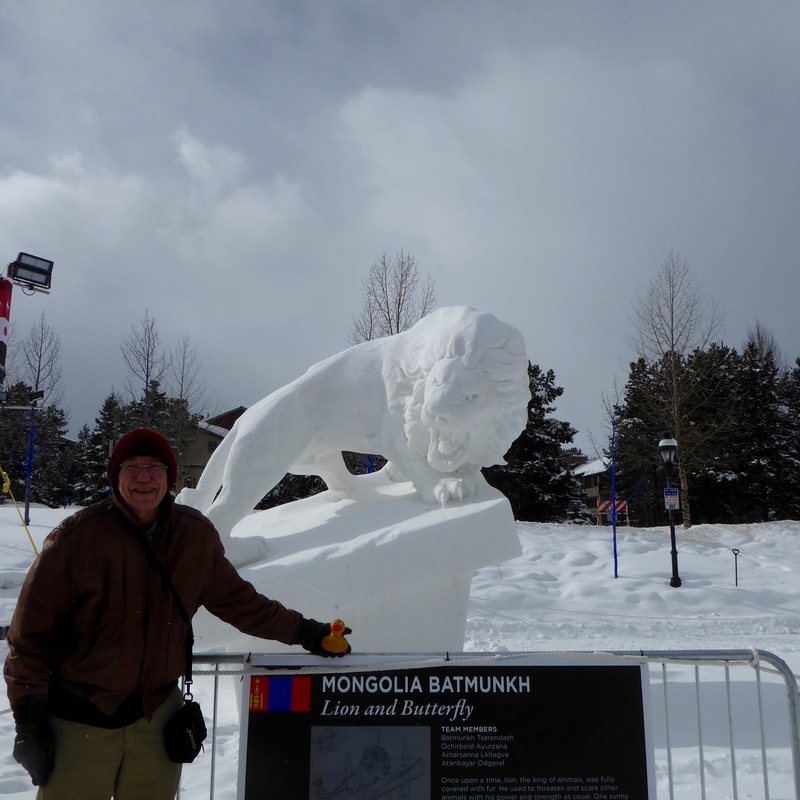 Team Mongolia, Bayanmunkh, sculpted the Lion and Butterfly. Thanks again, Tom. 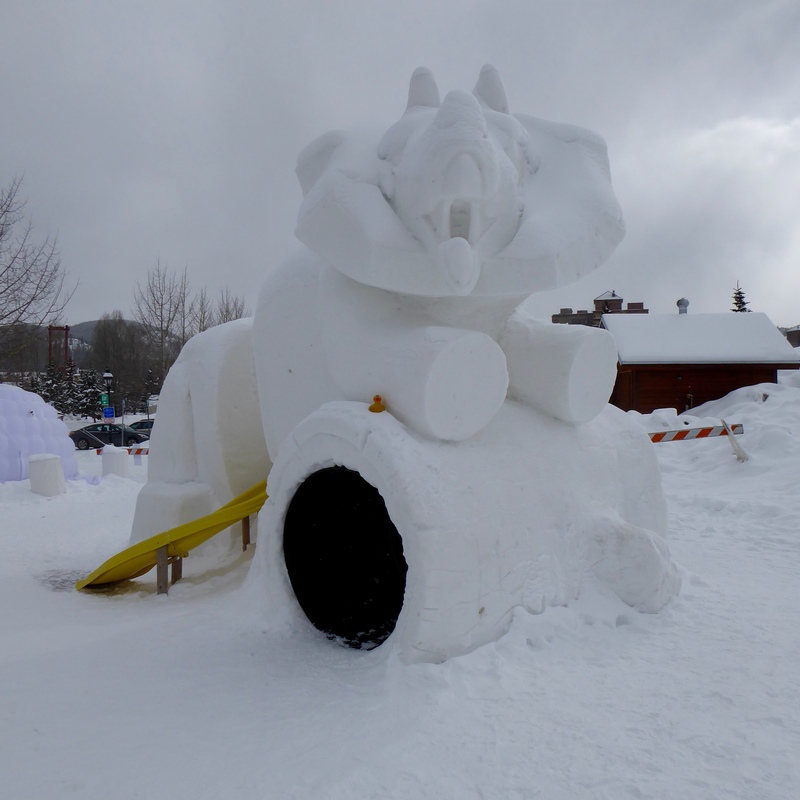 The slide and tunnel in this snow sculpture is great for small humans to play and have fun. Remember Budweiser is the sponsor of this competition. This is by Budweiser, not for competition, just for fun. Busdweiser, the sponsor, presents this beer stein. Mom, I hope you know that I, Zeb the Duck, fell in the cold snow. Don’t forget me! Now you know why I am so grateful to my friend Tom. The snow is cold and I could get lost in all this white stuff. All of these are wonderful works of art by very talented artists. And, the Artists’ Choice Award goes to Team Wisconsin for their representation of Dia de Muertos. 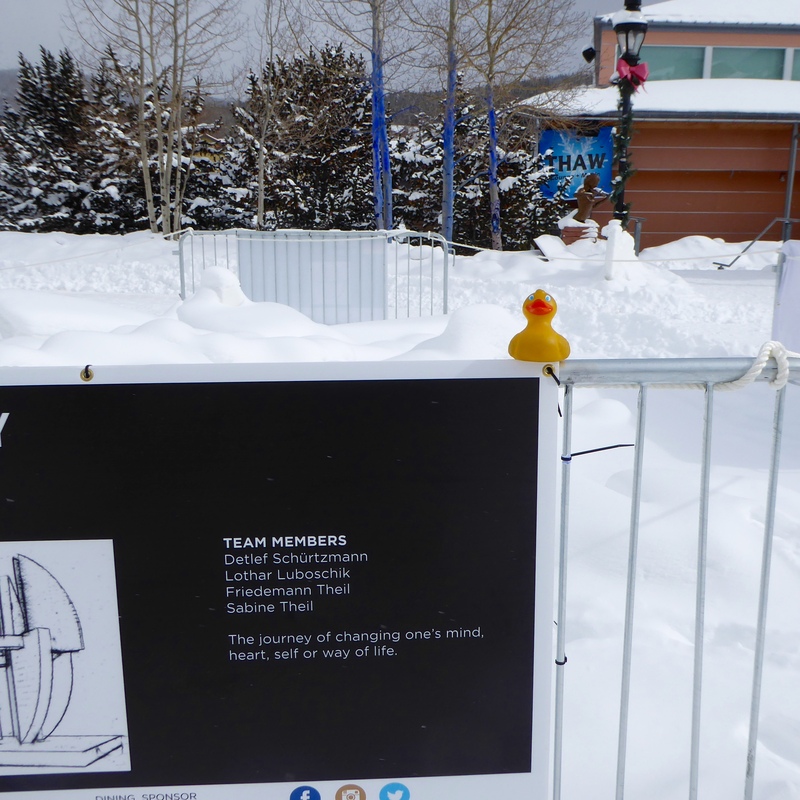 The Colorado Traveling Ducks appreciate all the talented artists, and we will eagerly await next year’s creations. These are great! 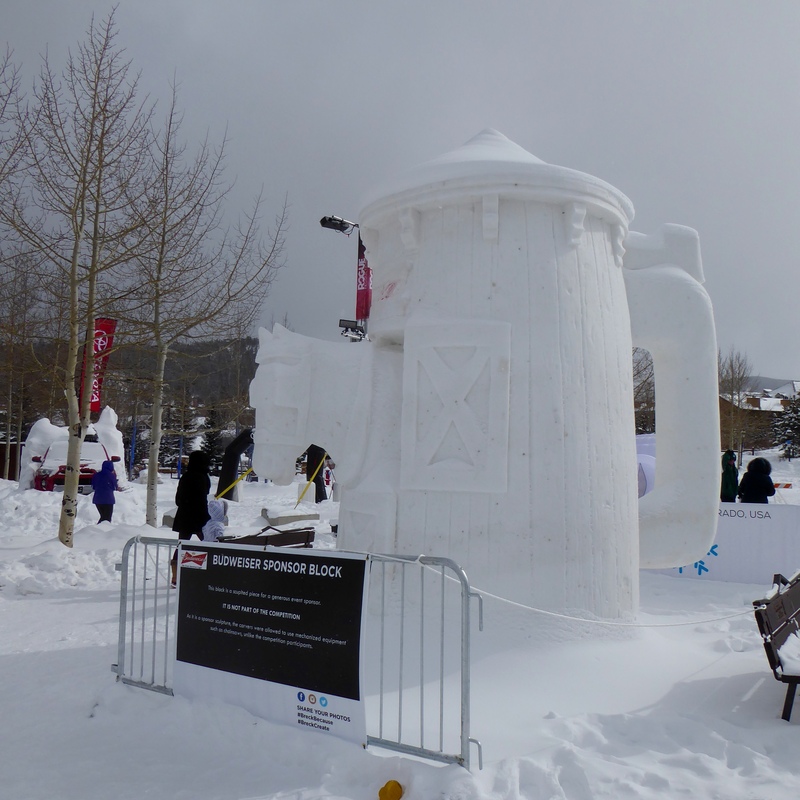 These snow sculptures will be destroyed Saturday evening, so if you have not seen them yet, please hurry! 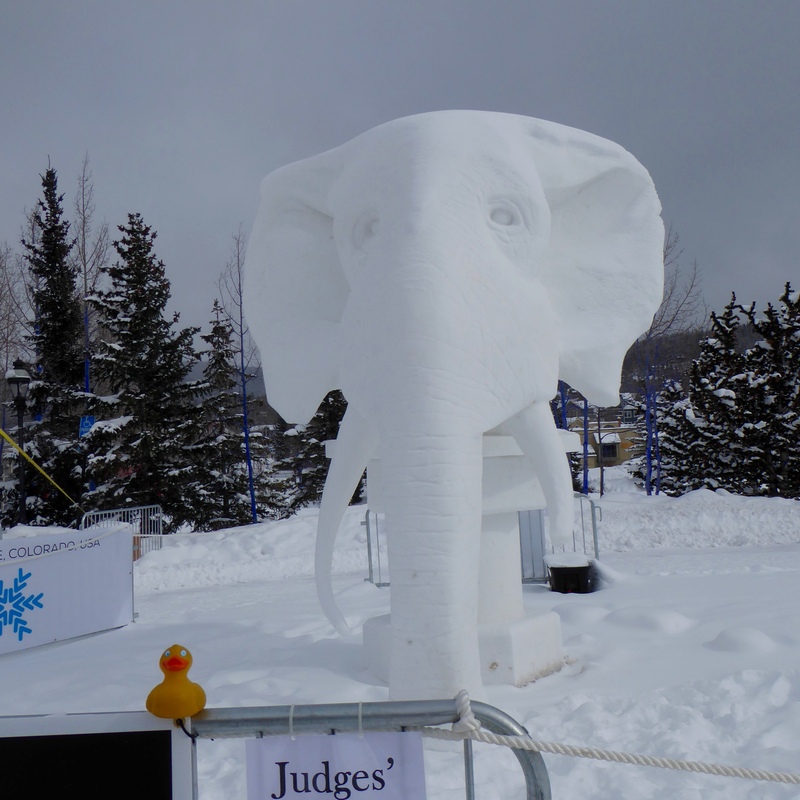 This entry was posted in Colorado, Uncategorized and tagged Breckenridge, Budweiser, Colorado, Colorado Traveling Ducks, International Snow Sculpture Championships, Team Loveland, Team Switzerland, Team Vermont, Team Wisconsin. Bookmark the permalink. Thanks for reading and commenting. 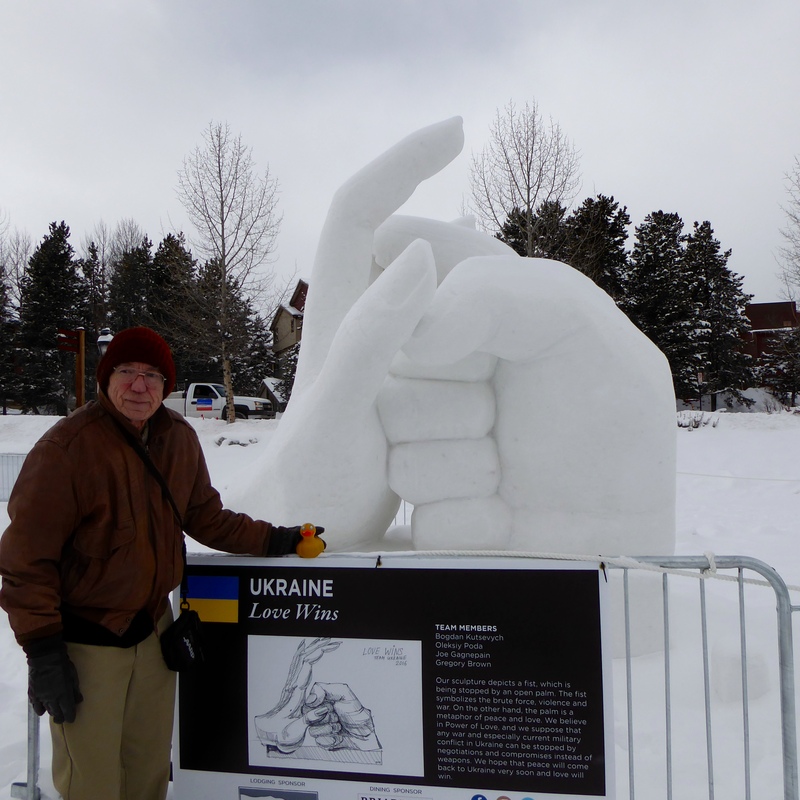 I love the snow sculptures too.